We realize that parents with small children are very concerned about their developing dental health. Therefore, we suggest that parents introduce their child to regular brushing and flossing to make sure that they are attuned to proper dental or oral hygiene early on in life. Brushing daily is important. Certainly, flossing is also important in keeping the mouth healthy and the teeth strong because mere brushing does not remove all those tiny food particles in the mouth. The fact is that tiny food particles build up and lead to tooth decay. Our strong advice to parents is to make sure that their child starts brushing and flossing at a young age. We suggest flossing as soon as the child has at least 2 or 3 teeth developing in their mouth. Generally, kids start flossing around two to six. However, this varies widely and depends heavily on the child’s tooth development. We are asked all the time if flossing baby teeth important. After all, the baby teeth will fall out and the child will eventually develop permanent teeth. We would like to stress to all parents that helping the child develop good oral hygiene at a young age is important. 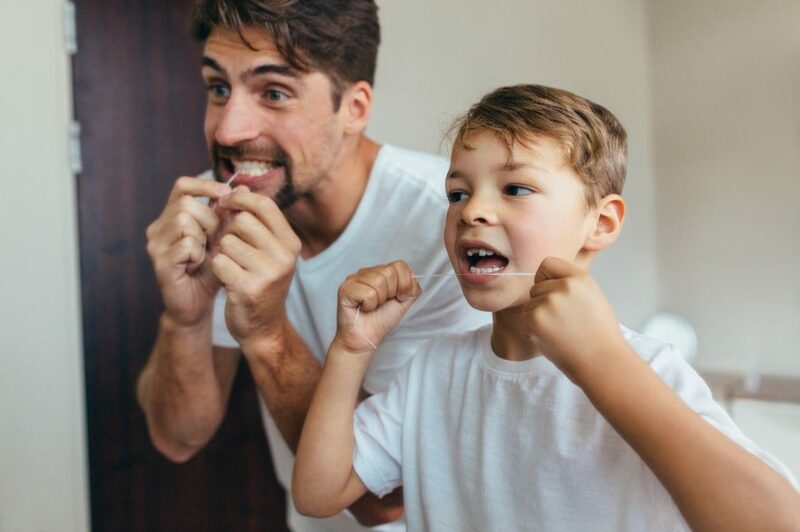 We strongly suggest that the parent provides instructions on flossing and floss their kids’ teeth until the child develops the ability to handle the floss properly alone. It’s also perfectly safe to let the child use regular floss. Handle the flossing procedure normally. Once the child is around six or seven, let the child attempt flossing alone, while a parent watches. Soon, the child will learn to brush and floss alone, just like the older children and adults in the house. social and meta description: Tips on getting your child to floss their teeth on a regular basis. Keeping kids’ teeth healthy with good oral hygiene practices. Why are Bedtime Routines so Important?